In anticipation of trout fishing this June for Trout (with Judy), I have created a old new pattern better known in Europe, the Ballon Caddis. It is a quick tie and floats in the water film, qualities that I like! 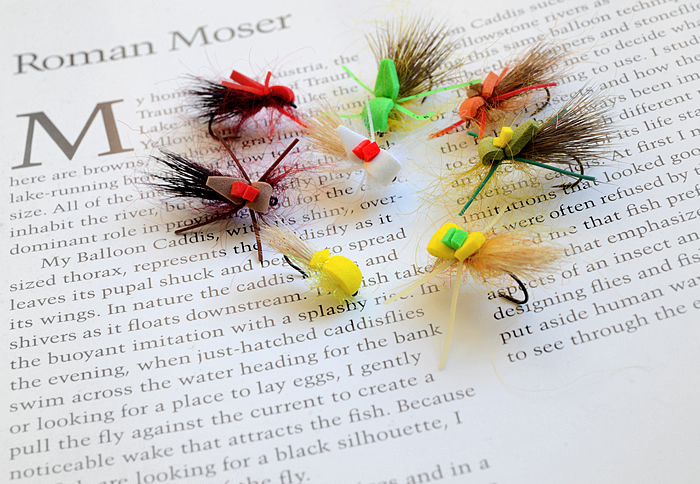 There are two variants shown, the original as concieved by Roman in Size 12 and 14 TMC 900BL Hooks in many wing colours, most with the yellow evasote foam (one sample below, but with Rainey 2mm foam). And then the larger X-Caddis variant on Size 10 Hooks that represents the bulk below. I will use the original on slick water, but the X variants on pocket water, and when I want to fish a nymph beneath it. The picture is on a page from Art of the Trout Fly with a letter from Roman, capturing his reference to movement as he fishes it. Very cool pattern, nicely tied.